If you pick up a 10-year-old mobile phone, you’ll notice that the front of the device is distinctly divided into two parts: the touchscreen and the physical keypad. Nowadays, the keypad has been completely sent out of the picture. The vast majority of most modern smartphones only have a touchscreen display at the front. The keyboard is just one of the apps and can be highly customised. The physical navigation bar with 3 buttons is increasingly becoming extinct. These days, the navigation bar has also become a part of the screen. The screen size of a smartphone has become one of its most important features, and smartphone buyers are considering it as an important factor while making a purchase. A large display ensures that watching a video, surfing the internet, or working on a document is an enriching experience. Until a couple of years ago, a 3-inch display was thought of as a large display. Nowadays, the same display will be labelled ‘tiny’. Currently, smartphones with a screen size over 5.5 inches are trending. Panasonic Eluga X1 is one of the flagship devices from Panasonic India. It has a 6.18” FHD+ notch display with a stunning 19:9 aspect ratio. The smartphone features a body crafted from stainless steel with its edges carved with a 2.5D curve finish to make the appearance more appealing. Panasonic Eluga X1 has a 16MP AI Camera at the front as well as at a 16MP + 5MP dual rear camera, which also boasts of Artificial Intelligence capabilities. The AI Camera is packed with a variety of effects such as Bokeh mode, Facemoji, and AI powered face beauty. Panasonic India has armed the smartphone with AI Sense, the IR face unlock which can even detect the user’s face in the dark. Eluga X1 Pro is powered by a RAM of 6GB with an internal storage of 128GB, and supports all the features of Eluga X1. Also, the former also boasts of wireless charging technology. 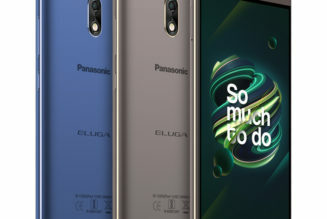 Panasonic India is soon going to launch Eluga Z1 and Eluga Z1 Pro which are also rumoured to have an HD+ display with a screen size of more than 6 inches. This smartphone features a 6.22” Max Vision display with a Full HD+ resolution with an aspect ratio of 19:9. It is powered by 4GB RAM and features a Qualcomm 636 processor for smooth multitasking. The internal storage on the device is limited to 64GB. In the camera department, it boasts of a 16MP + 5MP dual rear camera to capture crisp photographs, and the 12MP front camera is perfect for selfies. This smartphone possesses a 5.99” 2.5D curved Gorilla Glass display with an aspect ratio of 18:9. Powered by 4GB RAM, the smartphone runs on a Qualcomm 636 processor, and offers 64GB internal storage to store all your files. If you are a photography enthusiast, this smartphone has got you covered. It houses a 12MP + 5MP dual camera at the back, and a 20MP front camera. Boasting of a 6.22” Full View Display 2.0, Vivo Y83 has an HD+ display. The phone is powered by 4GB RAM and 2.0GHz Octa-core processor. The smartphone is provided with 32GB internal storage. A 13MP back camera and an 8MP front camera take care of the photography. In this article, we showed you a few smartphones which have amazing displays. These displays make sure that you have an immersive experience while watching videos, surfing the internet, or playing games.